With a game in hand in the league, you are in a very strong position. Your defensive record has shone again. Unfortunate to suffer defeat in the cup but you have European football to contend with which will surely more than make up for it! Just had chance to catch up on what I've missed. First of all, massive congratulations on your Story of the Month success mate! Very well-deserved for such a fantastic story. Secondly, very unfortunate to be knocked out in the second round on the technicality of the lottery of penalty shootouts. However, some good performances in the league puts you in great position with that game in hand on the top three. I'm also very impressed by your unbeaten run in the league and the fact you have only conceded six goals in eight games - fantastic work on your defence! 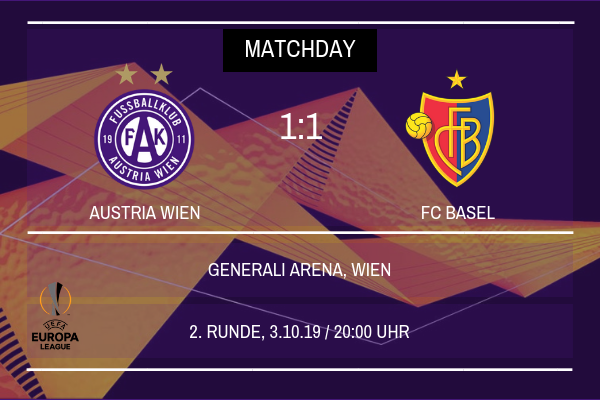 Die Vielchen were once again left frustrated in the Europa League as despite having the better of the game, FC Basel scored just after the hour mark to ensure they picked up a point and leave Austria Wien with only two points from their first two games of the game. Die Vielchen, considered the underdogs in the tie, especially following on from Basel’s 6-0 win over Standard Liege on Matchday 1, will be pleased with their performance against the team seeded first in the group, creating a lot of chances, but will bemoan their inability to put the ball in the back of the net as they were once again held. Christopher Steegmann named a rotated starting XI with Dominik Fitz and Blessing Eleke making starts for Die Vielchen’s second game of their Europa League campaign. Die Vielchen fans were left questioning the managers decision before kick off, but they will be happy with the chances created by a rotated forward line, and Michael Madl and Tomas Hubocan, starting at centre back performed well enough. It was a bitter pill to swallow at full time when Die Vielchen looked back on the chances that they missed over the course of the 90 minutes whilst Basel will be thrilled to be taking a point back to Switzerland. With only eight minutes gone, Die Vielchen took the lead amidst a raucous atmosphere at the Generali Arena, with Bright Edomwonyi tapping home for his sixth goal of the season after Michael Blauensteiner delivered a beautiful cross across the face of goal which found its way to the Nigerian forward who was waiting in front of goal. Edomwonyi, was perhaps guilty of costing Die Vielchen the three points over the course of the game, as time after time he was played through by lifted through balls from ball playing defender Michael Madl, with the Nigerian using his pace to get through one on one with Jonas Omlin. However the forward fluffed his lines every time, hitting the post or screwing the ball wide or giving Jonas Omlin every chance of saving the ball. It was these misses that meant that when Samuele Campos slid the ball home in a similar fashion to Edomwonyi’s goal, against the run of play to earn Basel a big point, Die Vielchen fans were left frustrated by their teams inability to see out their position of dominance against, fearing that the result may represent two points lost. It now means Austria Wien will head into Matchday 3 looking for their first victory of the campaign having dropped points in both their first two games of the Group Stage. Elsewhere in Group H tonight, Standard Liege were able to fend off a late Olympiakos fight back, beating the Greek side 3-2. The results on Matchday 2 mean that Basel remain top of Group H on 4 points, with Standard occupying second with three. Die Vielchen sit third on two points with Olympiakos bottom on just the single point. Up next for Die Vielchen is the visit of Admira Wacker in the Bundesliga, with Austria looking to close the gap on table toppers Red Bull Salzburg on Matchday 9 of their Bundesliga campaign. Meanwhile Steegmann and his team will travel to the Stade Maurice Dufrasne on Matchday 2 to meet Standard Liege. ScottT: Yeah I don’t think the results how well we’ve played and it’s frustrating to have drawn that game against LASK. However we’re still within touching distance so if we can put a consistent run together we should be just fine! Justice: Yeah we’re looking like we’re in a very good position to close the gap because of that game in hand. Defensively we feel very strong, Jubal has helped massively but it also feels like we’re much better going forward too and a little more free scoring right now. The cup defeat was hard to take but you’re right a European run would make us all forget about the cup exit! Jack: Thanks man! The cup defeat is something we’re going to have to move on from quickly but we’re looking strong in the league and we’ve got some exciting Europa League games coming up to get excited about so there is still an exciting season in store for us! Another solid point, hopefully it can be followed up with a much-needed victory against Standard. Another point against strong opposition. It is all a learning curve at the minute but one I fancy Die Velchen to stand on top from! As the final whistle blew at the Generali Arena on Saturday, Christopher Steegmann shook the hand of his counterpart Marco Rose before walking straight down the touchline after his side were thumped 4-1 at home by league leaders Red Bull Salzburg. The defeat to Salzburg was Austria Wien’s first defeat of the season, but the scoreline will leave a bitter sting for Die Vielchen fans and it was a defeat that means Austria have now slipped seven points behind Salzburg, albeit with a game in hand. Speaking to Sky Sports Austria after the game, Steegmann remained defiant that his side were now lagging behind badly in the race for the Bundesliga title. Salzburg stunned Austria early on during the meeting at the Generali Arena as they scored twice inside the opening ten minutes with Erling Haland and Xaver Schagler capitalising on defensive errors from Alexander Borkovic and Patrick Pentz to send the travelling Salzburg fans wild as they stormed into an early lead. Austria did pull one back in the 27th minute through Dominik Prokop and for a while it looked as if the hosts would pull the game back on to even terms again as they surged forward searching for that vital equaliser, however Steegmann said that Salzburg had Austria Wien exactly where they wanted them heading into the second half. “They definitely had us in a position where they could take us apart and pick us apart slowly if they had wanted. We needed to push forward for an equaliser and it’s a testament to the quality of football they are playing this season that they were able to execute what I imagine was their game plan all along. I think Zlatko Junuzovic would have to hold his hands up and say that his goal to make it 3-1 could have quite easily flown over but I also have to say it was a moment of brilliance from him and from that point you could see our heads drop and that’s why they got their fourth. It’s important for us to remember though that it’s only one defeat and it’s the only defeat we’ve suffered in the league all season so there is still a very solid base to build on and push on from this point moving forwards. ScottT: Two points from two games against the best teams in the group is a solid start but you’re right we need to go and beat Standard now! Justice: Definitely a learning curve but I hope we can make it a quick one and start to pick up wins sooner rather than later! The RB scoreline must've stung for sure, but any good team comes back from blips like that. With your defensive record previously it looks like a loss like that will only be a blip. Not the most ideal of results there. A win in the additional game you have over your rivals is essential to stay in touch with them, as a four point gap is much more manageable. Salzburg aren’t invincible and will inevitable drop points, so it’s up to you and the team to take advantage. Need to be strong and consistent to put pressure on. Bright Edomwonyi’s seventh goal of the season was enough to seal a hard fought victory for Austria Wien on Matchday 3 of their UEFA Europa League Group Stage campaign. After weathering an early storm from their hosts, Die Vielchen were able to pounce and claw their way back into a hotly contested game and seal their first three points of the competition and give their prospects of qualifying for the knockout stages, and playing European football in the new year a huge boost. It was a victory that fired Die Vielchen up into second in the group, and trailing Basel only because of the Swiss sides 1-1 draw at the Generali Arena only a few weeks previous. Standard Liege, fresh off their victory against Olympiakos on Matchday 2, started the game the better of the two sides with Mehdi Carcela causing particular problems down the right flank up against Cristian Cuevas. The Chilean has struggled of late in the left back position as he continues his recovery from injury and he left Die Vielchen’s flank open time after time in the opening ten minutes. Fortunately for Steegmann and his team, Patrick Pentz was back to his best in the Austria goal, and Die Vielchen rode out the early onslaught before striking venomously. In the thirteenth minute, a diagonal ball into the Standard penalty area found Nigerian striker Bright Edomwonyi with the forward taking a touch before firing the ball past Guillermo Ochoa in the Standard goal to make it 1-0, a goal that proved to be the match winner. It was met with much delight from the travelling fans at the Stade Maurice Dufrasne, with Die Vielchen fans used to seeing their team score goals like this, with Edomwonyi’s pace proving to be a particular problem for many teams both domestically and in the Europa League. Dominik Fitz was also causing lots of problems for the visitors down Die Vielchen’s right flank and was eventually fouled in the 43rd minute by Collins Fai who conceded a penalty, but the Cameroonian full back was left off the hook by a brilliant save from Ochoa to deny Blessing Eleke the second goal of the game. Fortunately for Die Vielchen, the second half of the game was played at a much slower tempo and although both sides carved out chances, the goalkeepers were the real heroes for both sides as they remained strong and kept both opposing attackers out. After two draws in their first two Europa League games, Christopher Steegmann will be delighted with the victory that also sees Die Vielchen keep their first clean sheet of their Europa League campaign. As a result of the victory in Belgium, Steegmann’s Die Vielchen side move into second place in the group after three games and with two games of the remaining three to be played at the Generali Arena, Austria Wien will be confident of going on to secure a place in the Round of 32 when the Group Stages reaches its conclusion in December. Meanwhile up next for Die Vielchen is the simple task of a trip to the Allianz Stadion to face off against Rapid Wien with Austria Wien looking to reignite their bid for the Bundesliga title bid. A victory for Steegmann’s side will not see Die Vielchen move up the league table but will see Austria Wien retain their interest in the title race and close the gap on the three teams above them at this early stage of the season. Jack: Was a really tough pill to swallow because they completely outclassed us but we’ve got to bounce back now and go and put in a long unbeaten run! ScottT: Yeah so long as we win the game in hand and close the gap back to four points we’re definitely not out of it and we can continue to look forward and concentrate on winning the title. Justice: Yeah they happen, United lost 6-1 to Man City and nearly won the league so hopefully we can bounce back from a big defeat and go one better and win the damn thing! Quality win against a solid side with a good reputation. That should help the team's morale. Well done! A much needed result in terms of trying to secure qualification into the knockout stages. No reason as to why that can't occur now, it's yours to lose! Ooo baby we're back in business!